Like moving into a new house or apartment, building out your studio space from scratch is one of the most exciting things for any creative professional. It seems anything is possible as you fantasize and nitpick over each and every vision and detail. Sometimes things turn out exactly as you envisioned while other times your masterful plan winds up being a continuous work in progress. That's the fun and agony in building out a new studio, and today it's our turn to share with you our approach in making a new Fstoppers video set in our new space. If you watched our video showing our new space in Puerto Rico, you were able to see our studio in its most raw form. We had little furniture, no fancy lighting, and some items like a giant pool table that had to be removed. Over the last few weeks, Lee and I have been working hard to build our dream space with multiple shooting locations, streamlined sets that are perfectly lit, and mics and cameras that are permanently placed for filming at a moment's notice. Some of it is taking much longer than we had originally thought, but when it finally all comes together, it's going to be an amazing place for photography and video production. For the full overview, definitely watch the video above but in this post I'm going to outline most of the gear that we are currently using for our latest "interview" set. For filming videos, we have completely transitioned over to Panasonic GH5 cameras. We find these to be the best small camera on the market for video for several reasons. First, the GH5 has dual stabilization in both its lenses and the actual in camera sensor. When paired up together, the GH5 lets you hand hold your camera and still get super steady footage. You can see how little camera shake is in the hand held segments of the video above. The GH5 is also great for interviews and long recordings because unlike most other comparable cameras, it can record for as long as you like. Most cameras have a 29 minute record limit but with the GH5, as long as you have a charged battery and room on your memory card, you can record for hours uninterrupted. For this set, we have replaced our batteries with AC power adapters so our cameras never run out of power. At the moment, we only have two GH5 cameras for this set (we've been using a Sony A7III as the third camera in our Critique the Community series) but eventually we will have 3 cameras in total. We are also mounting all of our cameras on our favorite all time tripod, the Benro Mach3 TMA38CL which we did a full article on a while back. Each of these tripods is fitted with a compact fluid head, the Manfrotto MHXPRO 2W, which is not only affordable but also much smaller than some of the other fluid heads we have used in the past. We've used a lot of different types of lighting gear over the years, but for this particular set, everything is being lit with LED lights made by Fiilex. Our main light is a single Fiilex Matrix II LED light. As you may know, we've been using Fiilex lights forever in the Fstoppers studio but this is the first time we have used one of their Matrix LED lights. This thing is pretty amazing because it's super bright, can color correct from 2,800K all the way to 10,000K, has a tint adjustment, and also has full RGBW color control for all sorts of extreme color shifts. If you get the Matrix Kit, you also get a small softbox to soften the light, but we've found that this light is powerful enough to actually just bounce the light off the ceiling. We haven't had an LED light powerful enough to use bounce light but we are excited to be able to get soft light by bouncing because our studio is still relatively small. For the rest of the set, we have placed 3 different Fiilex P360 Pro Plus LED lights around the room to give accent lighting to our talent as well as some of the furniture and drapery in the room. These lights come in a 3 light kit that makes it easy to travel with while also supplying you with 3 light stands, 3 barn doors, and a single 12"x16" softbox. We love these lights because not only do they offer you white balance color adjustments, but you can also adjust the green and magenta tint which really cuts down on the gels you need to carry with you. Also, because we mainly use Profoto lights for our photography, the Fiilex are great constant lights because they can perfectly mount all the Profoto speed rings and grids without any adapters. 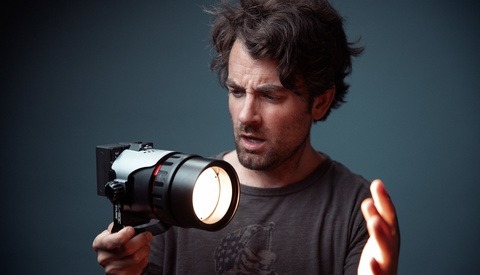 This means we can use all our existing light modifiers without having to re-buy a bunch of new gear. Since Lee and I are mainly photographers and videographers, learning how to engineer clean audio has by far been our biggest challenge. For years we have simply relied on our Sennheiser Lav Microphones (G4 is the latest model) because not only do they allow your talent to move around freely but they also guarantee clean audio because the microphone is mounted so close to your subject's mouth. Even though we have upgraded the ME 2-II lav mics with much higher Sennheiser MKE2 Gold microphones, these lav mics still don't always capture the most dynamic audio. For the highest audio fidelity, sometimes a good shotgun microphone does the trick. The shotgun microphones we are currently using and testing out both made by Rode. The highest quality microphone we are using is the Rode NTG8 Precision Broadcast Long Shotgun Mic. This thing is pretty intense as it's about 24" long but it gives you a supercardioid pattern that only picks up sounds directly in front of it. This is good for when you need to isolate your subject from a noisy environment while maintaining all the clarity you would find from a true condenser mic. To record this microphone directly into the camera, we use the Panasonic DMW-XLR1. Not only does this give you a nice preamp for your GH5 but it also supplies phantom power to any of your active microphones. The second mic we have is the Rode NTG3 Percision RF-Biased Shotgun Microphone. This mic is the little brother to the larger NTG8 but it has a "line+gradient" polar-pattern instead of the more common supercardioid pattern fround on the NTG8. I honestly don't quite know the difference between these two distinctions yet but you can def hear less ambient noise in NTG8 over the NTG3. Infact, we have found that NTG3 picks up a little too much bleed that we are currently having trouble using both of these shotgun mics when two people are speaking in our set. So until we master the art of overhead boom micing, we will probably continue to use our lav mics for multi person interviews. 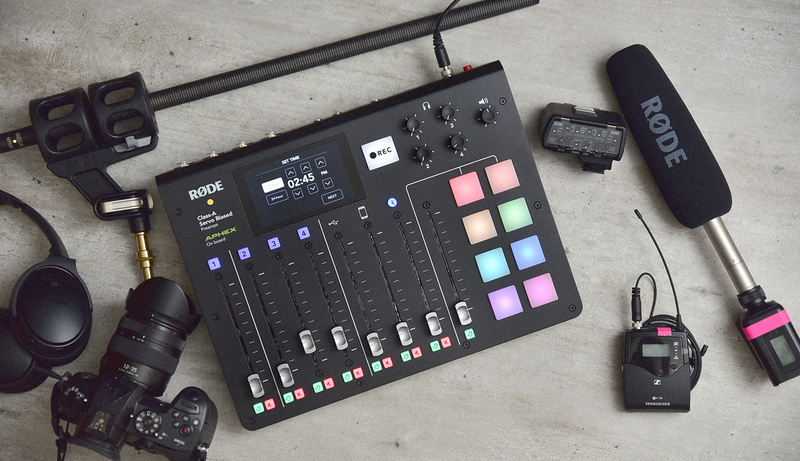 Finally we also have a Rode RODECaster Pro which acts as a mixing board for live broadcasts. We haven't had time to actually get this thing up and running but we do plan to do more podcasts, multi person interviews, and maybe even some live content to social media. The RODECaster is kind of an all in one device for people like us who are just getting our feet wet in the podcast world and need something that is easy to use in simple to use package. It has the ability to mix four separate microphones, input a bluetooth device, and pipe in phone calls. It also has eight pads that you can program with sound effects or music to give your broadcasts a more professional feel. Again, this is pretty new territory for Fstoppers but something we look forward to playing around with as we get our studio up and running. Of course when building a permanent set, you need a lot of light stands and mounting grip to put everything in place. While we are experimenting with a lot of new stands and mounting options, at the moment this entire set has been built using one of our favorite stands of all time: the Manfrotto 420B Combi Boom Stand. While these stands are the tallest or most robust stands we've ever used, we do love that they can be used either as a traditional light stand or quickly converted into a boom stand. Boom stands are great for when you need to place a light over your subject but don't want the stand in the shot or if you need to mount microphones directly over your talent. The only problem with these stands is that the center column doesn't extend very high when in the boom position and the footprint of the stand is still pretty wide and takes up a lot of space. We have some other stands on order as well and we plan to do a few videos just on light stands. To dampen sound we are currently using a few Matthews Sound Blankets to try to absorb sound reflections bouncing off the walls. Many of you guys have given us tons of suggestions and advice on what sort of materials we can use to kill some of the echo we are dealing with in this concrete studio. We have ordered a few things but they haven't arrived here yet in Puerto Rico. These blankets by Matthews do seem to work pretty good but I'm not sure why they don't make these in a neutral color like white or black for video and photo work. While the blue color hasn't created any major color casts yet, it would be nice to have white ones where we could bounce light off of them. Lee has ordered another brand of blankets that have white on one side and black on the other side which seems like the best option for controlling light spill, but since the company won't ship them to PR, I will have to travel back to Charleston to check them onto the plane. We will continue to keep you updated on our quest to remove as much reverb and reflections as we can. I have 2 Aputure 120Ds and I was thinking of getting the version II or the 300D, but the Fiilex sounds appealing since I have lots of Profoto accessories. Is the yolk strong enough to hold a 4x6 Chimera lightbank? And how does the output compare to 120D II? P.S. I agree with the 420B stands, I recommend them to everyone. Very interesting and to the point. Thanks guys. Guys, it was not supposed to my guest room? 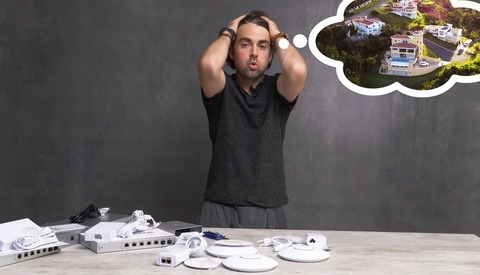 Looking through your video, I couldn't help but think, wow, there's a lot of clutter, and a potential for some technical problems too! First - NEVER put your computer on the same circuit as your lighting (or anything else!). Second - Keep your work environment safe! I couldn't help but notice the power bar (or strip) in the video was in what looked like a traffic area close to your camera. That's an accident waiting to happen. Screw the power strip to your baseboard near the outlet and run power cables to the lights. Tape them down with gaffer tape to avoid tripping on them. Third - about miking your guests and yourself in the studio, good quality lav's are still the best. Look at any major television newscast, and you will observe all the announcers use lav's. Part of it is audio quality, but the other reason is clarity and pickup. Close proximity is best. 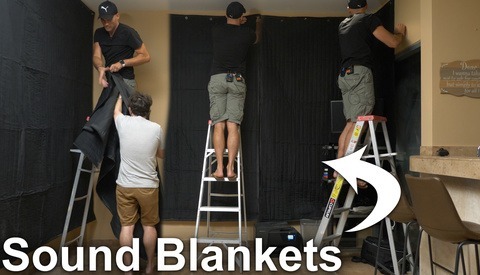 This eliminates the boominess and audio reflections off walls and solid surfaces you might get with a boom mike. The other issue is with two or more open boom mikes, you will increase the amount of unintentional ambient noise pickup from fans on the lights, your computer etc. And of course, there's no clutter with mike stands and boom attachments. The exception is for ENG work, where shotgun mics are attached to cams for directional background audio, but even then, wireless lav's and wireless hand held mics are still the norm for reporters. Sennheiser is a popular brand in the broadcast world for wireless mics. FYI - I worked as a second engineer on a TV mobile truck with Dome Productions (Toronto) and the CBC - Canadian Broadcasting Corp for live event broadcasting, everything from MLB baseball coverage to international conferences like APEC, so I was heavily involved with everything from light, to sound, video and more. Why are you talking about computers? It's a monitor hooked up to the camera. There's a computer in the room, but they never said it's on the same circuit. I disagree about lav vs boom. Sure, closer is usually better, but boom mics record at a more natural speaking distance, you're usually 2-4' from someone speaking to them, not 6", there are a million threads and disagreements on this subject. There are VO talent using the MKH416 for work. There are so many mics for so many different voices, you can go down a very deep rabbit hole. Of course a good lav mic is better than a bad boom mic. They obviously have a relationship with Rode if they're sending Fstoppers free stuff. I doubt they'll be adding in Sennheiser gear, though I do have Senn's new XSW-D which I like very much. From the vid I see Patrick is using a Dell monitor, but I could also see an active audio LED bar VU meter in the top left, so who knows. Maybe he has a computer tied into it somewhere off camera, for simultaneous recording. A hard switch on and switch off of a monitor via a power bar can be hard on the electronics of better quality monitors. Most have a standby mode when switched off by the monitor power switch, so the electronics or power supply stay at a constant temp, and just the screen illumination is turned off. Many are now backlit by LEDs. I have a Sennheiser MKE shotgun with dead cat windscreen, and though I like it in the field, I personally find it's not the best for studio use. But that's me. Agree there's lots of pro's and cons of lav vs shotguns. Certainly on movie sets and action scenes, booms are favoured for more directional use, but directors also have total control on ambient sound and the studio acoustics in major production houses are well controlled. As to window scrim, what you linked to is a tarp, and not a true cinema scrim that's black on both sides with defined light transmission qualities. The Rosco black scrim is neutral, so there's absolutely no colouration added to the incoming light. You can also get it in different light cutting f-stops. CITY-TV here in Montreal uses Rosco scrim on their windows to show city scenery in the background through their windows. I note the CBS morning show set often uses New York city street scenes in the background, and its not done with a green screen or a virtual set.